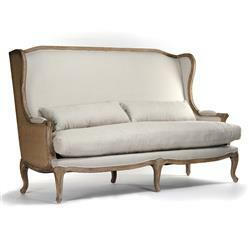 We love the play on proportion and inviting attitude of this French country high back sofa. Natural Belgian linen adds a relaxed, elegant contrast to a washed burlap back while traditional details and techniques create a refined effect. While it is technically a dining bench, this classic piece is easily translated into a living room or library.